​SrA. Courtnay Hester sets up an electric generator to feed the Joint Task Force-Port Opening Senegal operations center Oct. 5, 2014, at Léopold Sédar Senghor International Airport in Dakar, Senegal, in support of Operation United Assistance. Air National Guard photo by Maj. Dale Greer. Oct. 24, 2014​—Gen. Martin Dempsey, Chairman of the Joint Chiefs of Staff, took to YouTube Tuesday to address concerns over Operation United Assistance—the international effort to aid in the relief of the growing Ebola crisis. “We’re doing what we do best: leveraging our unique capabilities to support the international and US effort in response to this crisis,” Dempsey said. The lead agency for the operation is USAID, with the Defense Department filling in to support the efforts as needed. However, DOD’s “unique capabilities” do not include actual patient care. 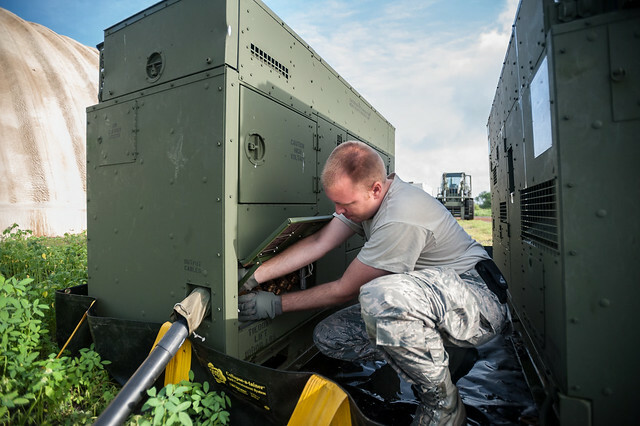 For airmen, these capabilities consist of delivering supplies via international staging bases—or ISBs—and establishing Expeditionary Medical Support Systems (EMEDS) to assist US public health workers with their efforts. Members of the Kentucky Air National Guard’s 123rd Contingency Response Group deployed to Senegal to “facilitate and expedite the transportation of equipment, supplies, and personnel” from the intermediate staging base at Léopold Sédar Senghor International Airport in Dakar into the affected region, Col. David Mounkes, commander of the Joint Task Force-Port Opening Senegal and commander of the 123rd CRG, told Air Force Magazine via email. Airmen continue moving protective medical equipment, medication, medical test equipment, tents, vehicles, generators, Army mobile deployable rapid assembly shelters (also known as Drash trailers), diesel fuel, lithium batteries, forklift and support personnel, cots, MREs, water, milk, and various other support items through the airport, he said. For members of the 123rd, this is the type of mission they train for, Mounkes said. “This is what we do, and we feel privileged to be able to do it,” Mounkes added. Between “solid leadership of the team down-range,” and educating and training airmen “about public health, about Ebola, the way it’s transmitted, what they would and wouldn’t be doing,” and reassuring them “that when you’re not treating an Ebola patient— which they would not be doing and did not do—the risk of transmission is essentially zero,” concerns over the nearly-three week mission were eased a bit. Earlier this month, some members of Congress expressed concerns over the safety and healthcare of US service members traveling to Africa to aid in the efforts. However, lawmakers authorized $750 million to fund the operation on Oct. 10. “While the mission in West Africa will not include direct care to patients, the safety and health concerns of the men and women of our joint forces and their families remain of greatest importance to me and our Joint Chiefs,” Dempsey said. Pritt echoed the Chairman’s assertion, saying the safety of airmen on the ground was a top priority and airmen felt confident in their preparation and health security during the mission.